These apples with Apple logos and products are the handiwork of a Japanese Apple fan (more pics on the site) who covered Fuji apples with custom Apple stickers, then waited a month them for to mature. What’s this obsession with copyright infringement?! Ooh, look there’s a logo with a green apple in it! Wonder if Apple will sue them? There’s a guys growing apples in his backyard! Maybe they’ll come over and chop his tree down. Or better yet, break all his fingers for being creative. That’ll teach him. really now? I’m a PC, maybe I stick Gates’ head on a pumpkin or something next year. hahah super criativo!!!!! adoro maÃƒÆ’Ã‚Â§ÃƒÆ’Ã‚Â£s!!!! Interesting and clever, a completely natural way to create the logos on the fruit’s surface. If Apple had one or two clever people over there in Cooperteeeno they’d contact this person and get permission for the idea and use these ‘logo’d’ apples at the next Apple Computer event. 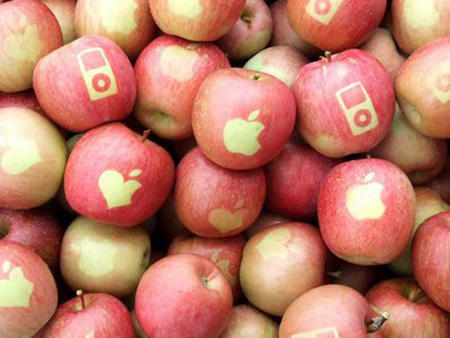 its amazing to see like this ..wish i count eat the ipod apple…but the eatable apple..lolzzz.